We’re looking for 2 South West artists who work with older dancers in a range of community and professional dance settings to join us for an exciting exchange project in partnership with CODA Oslo International Festival, the Norwegian Resource Centre for Arts and Health and Dans in Trøndelag. Application is upon receipt of completed Criteria and Expression of Interest. Please send your application to emma@pdsw.org.uk by 10am, Monday 31 July. Expressions of Interest (that meet the criteria) will be entered into a hat and drawn out by a member of the PDSW team on Monday 31 July. We recognise how exciting this opportunity is and based on the feedback we received in 2015 have decided to stick with this process as the fairest way to determine the recipients. The successful artists will be informed immediately by phone or by email and we will get straight into the logistical planning. All other applicants will be informed by the end of the week. Details of all applicants will be kept and used to build a network of dance practitioners committed to creating work by, with and for older people. You will receive information about future opportunities and events. If you do not wish to be including on this list please do let us know. Please complete the Criteria Form and Expression of Interest Form and send to emma@pdsw.org.uk by Monday 31 July, 10am. PDSW has been developing its policies and support for dance work by, with and for the over 60s under the umbrella title Joie de Vivre since 2012. This includes kick-starting Dance in Time 1 October celebrations of work by and with older dancers in association with Rosalind Conlon, developing international partnerships to nurture work by older dancers and dance practitioners who specialise in working with them, piloting a ‘Dance Companions’ scheme, starting a competition for films of work by older dancers and commissioning a collection of photographs of older dancers in iconic SW locations. 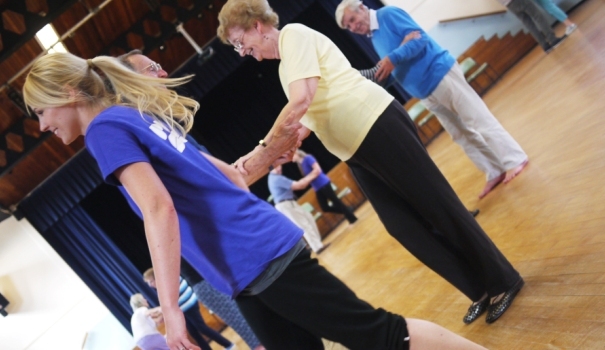 We also run classes for older dancers called Older and Perfect plus specialist classes for those with Parkinson’s Disease. This particular opportunity has come out of our strengthening relationship with dance colleagues in Norway and our shared interest in nurturing dance practitioners who work with older people. Pavilion Dance South West is the National Dance Development Organisation for the South West of England, supporting regional dance strategy development and representing the South West Dance sector nationally. In our Bournemouth-based venue, Pavilion Dance, we present dance performances, live screenings, art house films, exhibitions and more than 40 dance classes every week. CODA aims to strengthen dance as an art form in Norway. The festival focuses on presenting a variety and diversity within an international and Norwegian contemporary dance arena through a biennale of dance of the highest artistic levels. CODA wants to create Norwegian dance opportunities to develop through performances, courses, workshops, seminars and events, focusing on Oslo and Norway as arena for contemporary dance. CODA+ is a festival programme for senior citizens and the elderly at residences and senior centres in and around Oslo. CODA wishes to create new spaces and connections around the experience of dance as an art form – for everybody. The centre´s primary mandate is to bring forth an even better interaction between research, education and practice in the fields of arts and health. The Norwegian Resource Centre for Arts and Health was established in July 2014; and is a collaboration between Nord University, Nord-Trøndelag County Council, Levanger municipality, The Nord-Trøndelag Health Study and Helse Nord-Trøndelag.